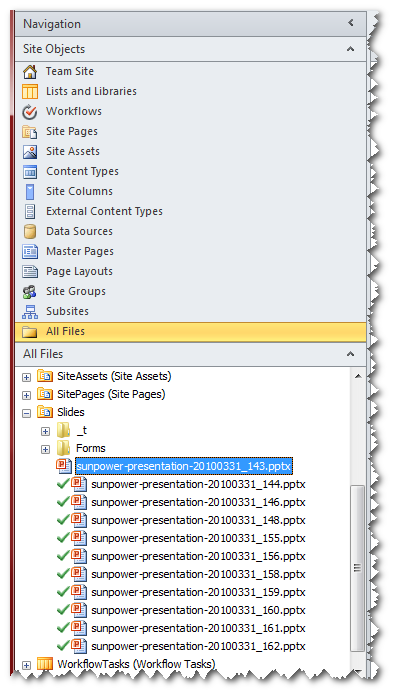 What the heck is going on with SharePoint 2010 slide Libraries? | Are you a user? 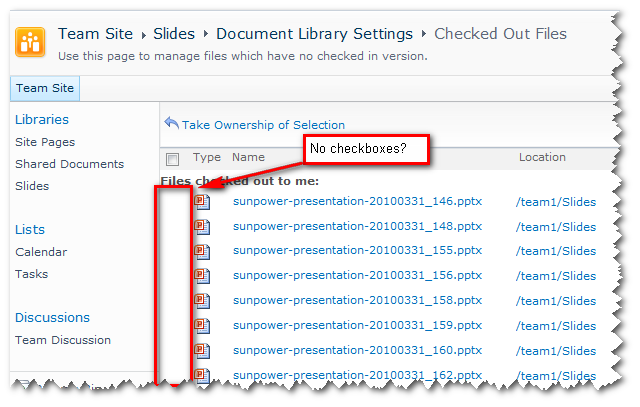 What the heck is going on with SharePoint 2010 slide Libraries? 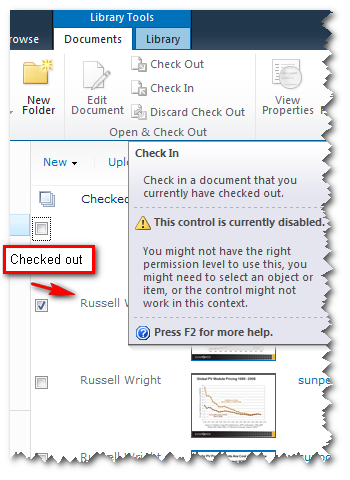 For all the great features added to SharePoint 2010, it is still mind boggling to see what issues remain with the user experience. 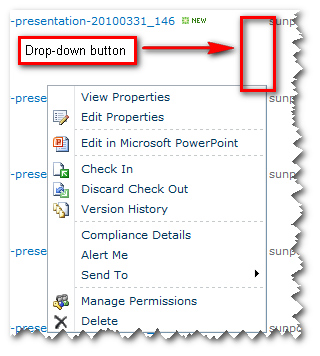 Take this recent experience with SharePoint 2010 slide libraries. Terry turned me on to this in his instance so I began a validation in my instance. My instance is currently patched with the October 2010 CUs. 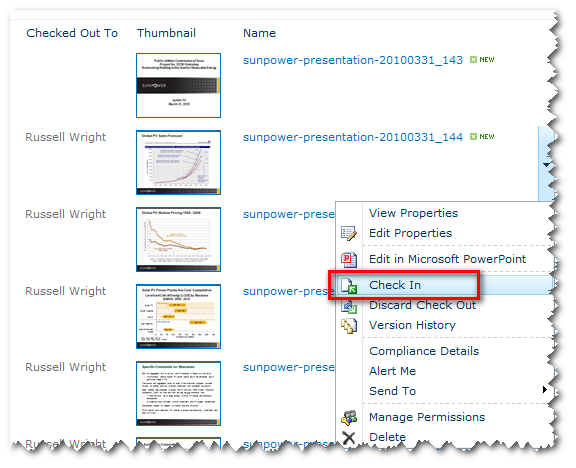 I published a PowerPoint presentation to a slide library in SP2010 that had “require check in/out” enabled. All slides were published in a checked out status. I needed to check them in. 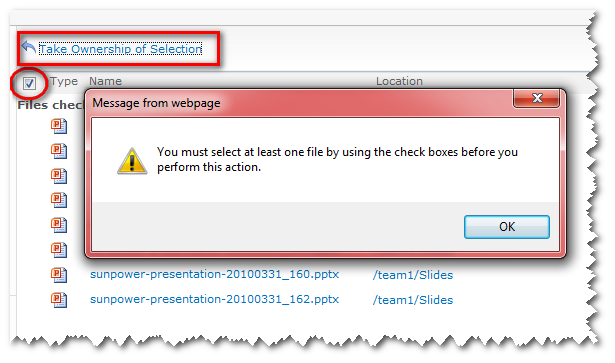 No problem, select multiple slides with the new “multiple selection” feature and check in. Nope, can’t do it. Security issue? I’m a logged in as a site collection administrator and I’m in the Owners group that has access to the slide library. Shouldn’t have a problem there. Okay, let’s see what happens if I don’t select multiple slides. Nope, tool ribbon is still disabled. Even tried enabling “protected mode” in IE for trusted sites (in which this site resides). Do I have access to check-in from the drop-down? Yes. Now the special triple click trick. Click the disappearing drop-down button. The context sensitive drop-down list appears. Click it again and the button disappears…but the drop-down list remains. Click again and the drop-down list disappears. Ahhh…the wonders of Ajax. But I digress. Let’s take a look at this problem from an SPD perspective. We can see the files that are checked out. Let’s select three files and check them in. After performing a check-in, we still see the “checked-out” checkmarks. Even the context-sensitive menu is confused about whether these slides are checked in or checked out. Perhaps it’s that nagging problem with SPD where it doesn’t refresh correctly. Press F5. No change. After closing and reopening the site in SPD. No change. From the browser UI I validated that they are still checked out. Another non-functional feature? It looks like SPD continues to be confused as to the status of the slide, even after closing SPD and starting a new instance. SPD shows the same slide as checked out. No amount of F5-ing changes this. But wait! There are no checkboxes with which to select the items? Perhaps I can use the “select all” checkbox. Nope. The "select all” checkbox is non-functional. What’s up with this? Oh, and this appears to work just fine on a document library in the same site. I’m certainly open to others’ experiences with Slide Libraries in 2010. Perhaps the Dec 2010 CUs will help? As another test I went into SPD 2007 and tried the same thing. No check-in will occur from SPD 2007. So, I guess they didn’t break anything. Not a solution, just a confirmation. Same thing happens here. Slides get published as being checked out, with no apparent way to check them in unless you go to the Content and Structure area. Mine’s a lot worse. I only have “Alert Me” active on the ribbon; everything else is grayed out. Crap!! The “Select All” checkbox works for me but it’s useless since I don’t have the buttons in the ribbon to perform bulk actions such as checking in all (or multiple) slides. 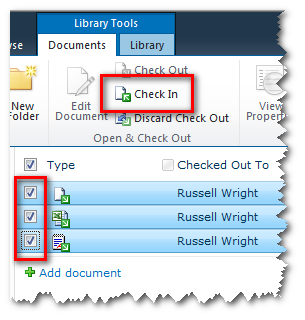 As you said the check in/check out options are available from the drop-down menu near each item making the action possible (although painfully, singolarly, manual). Another lovely bug I found is that when you upload slides to the the library, by default all slides get uploaded as checked out to you (which wouldn’t be that big of a deal) and are visible only to you (which is annoying as other users can’t see your slides until you check them all in – which we have already seen is not exactly a quick operation). Hope this can help others asking themselves the question in your title…. do you know if anyone has been able to address any of these issues yet? 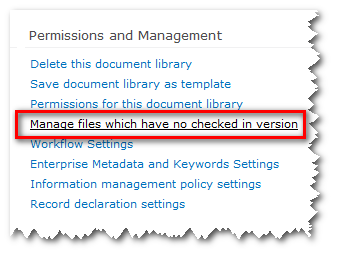 easy fix, you can do 1 of two things, disable the “required check in” feature in versioning setttings. 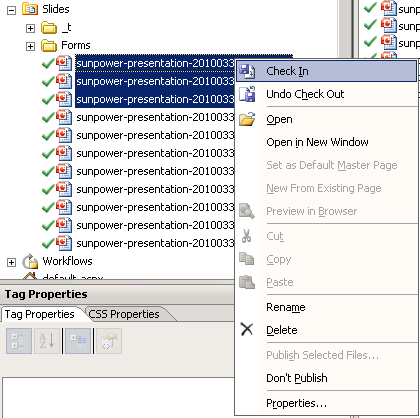 then upload the slides, go back and enable versioning or you can keep versioning enabled, upload your slides, go to manage content and structure, select the slide library, and select all the slides and select action and publish, that will automatically check them in. This of course is only a viable solution if you have the proper admin rights. I am still searching for a solution for general users. One thing you should consider. 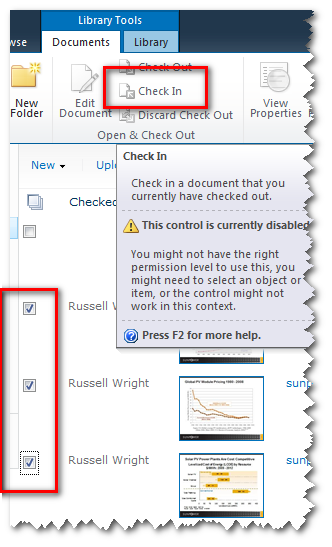 Uploaded files that have required fields must have those fields completed before SP will let you check them in. The only way to do this after uploading multiple slides is to update the slide metadata one by one and then check in that particular slide. 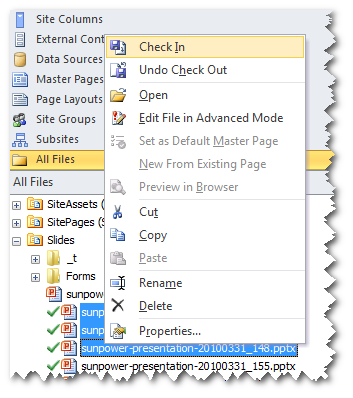 You can also complete the required metadata in PowerPoint before uploading if you know what fields are required. Check in one slide and note the remaining items that are required to be completed first then update those items in PowerPoint. 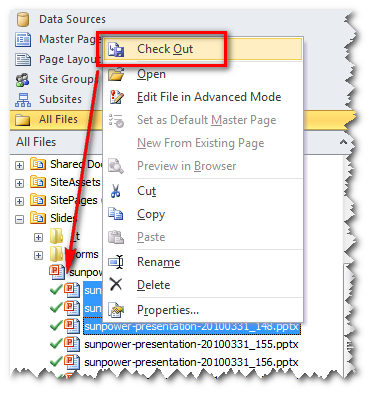 Then click File/Save $ Send/ SharePoint Site and if you’ve already been in the slide library, the URL should already be displayed. 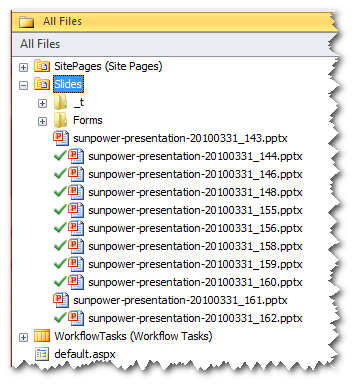 Publish the PPTX to the SharePoint site and be done with it. Or like I mentioned, check-in one slide at a time. When you publish slides that require check-in and out, a dialog box will appear asking if you want to enter a note on what’s been done to the slides and if you want to keep the slides checked out after publishing the presentation. Click no and in a couple minutes the system will replicate the updated slides and information regarding their checked in or out status to your site. It’s not an instant update so give it 30 seconds before refreshing the page.